I have to say, Maxwell has been a little spoilt this week. In the space of a week Maxwell has managed to get new trainers, a new bag and a beautiful Funpit table and stool off us however he also got one other surprise. 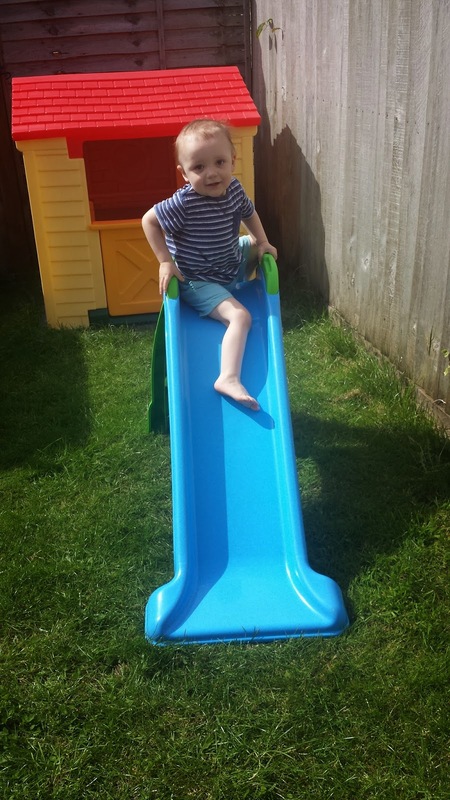 Whilst on holiday Maxwell adored going on the slide at the play park and since being back Maxwell has continued to love going on the slide at our local park, so I thought it would be a good idea to get him a slide for the back garden. After having a look on the internet I found a Little Tikes slide priced at £20 including delivery - a bargain as they are normally priced at over £35. Within 2 days the slide was here and ever since Maxwell has been playing on the slide happily. When going down it he loves to scream "weeeeeee" and he loves to also push his cars and toys down it. After visiting Maxwell's potential new preschool on Monday, we decided we loved the place and have arranged for Maxwell to start attending once a week. The whole setup and environment was lovely and the staff were very friendly. We found there was lots of activities for Maxwell to do there and we were chuffed when Maxwell decided to go and play by himself. I am unsure how he will react when we leave him by himself there however I hope over time Maxwell grows to love it and it will help him develop lots of new skills. This week has seen Maxwell try more foods. From vegetable noodles, to eggs and sausage, to milkshakes Maxwell has very much impressed me. We were stuck in a rut where Maxwell only wanted to eat dried foods and vegetables and fruit however it is wonderful to see him enjoying food again and trying new things he has never tried before. Last week I told my readers about Maxwell playing up and its safe to say I really struggled with his behaviour. As Ben works nights I find myself bringing up Maxwell on my own mostly and I find that some days can be a lot harder than others. Having to tell Maxwell off constantly and him not listening to me was frustrating. Last week Maxwell nearly reduced me to tears however this week Maxwell's behaviour has been much better and we are back to having the polite, bright, helpful and friendly Maxwell. I am hoping last week was just a blip. This week has seen Maxwell trying to say lots of new words. From Ted to slide and house, Maxwell is slowly getting there. We are now hoping that preschool will give him the final push into speaking and soon we will be able to have proper conversations with Maxwell. he looks so happy on his new slide!! Sounds like Max has had a great week. Really impressive on the food front and the slide is always a hit isn't it! Love garden toys just so much fun. Aw look at him on his slide! Hope preschool goes well! He will soon settle in! It definitely sounds like he's had a lovely week! The slide is lovely, lucky Maxwell! I love the fact that he loves his slide so much! Hope his speak comes on through preschool too.